Shardul Kadam was born in 1983 in Thane, Maharashtra. In 2004 he received his degree in B.F.A. from Sir J.J. School of Art, Mumbai. In 2006 he received his degree in M.F.A. from Sir J.J. School of Art, Mumbai. In 2007 and 2016 he had solo shows at Artist’s Centre, Mumbai. In 2008 he participated in a group exhibition at Jehangir Art Gallery, Mumbai. In 2009 he participated in Art Today, Singapore. In 2000, 2010, 2011 and 2012 he participated in group exhibitions at Artist’s Centre, Mumbai. In 2013 he had a solo exhibition at Jehangir Art Gallery, Mumbai. In 2014 he participated in ‘The Divine Craftsmen’ at Gallery 7 at Kalaghoda, Mumbai. In 2012 he participated in Regional Art Exhibition at Lalit Kala Akademi, Chennai. In 2013 he participated in National Art Exhibition at Lalit Kala Akademi in Lucknow, Uttar Pradesh. In 2004 he received a fellowship from Sir J. J. School of Art, Mumbai. From 2007-2009 he received a scholarship for ‘Young Adults’ from the Ministry of Culture, Govt. of India. From 2003-2004 he received the Late Shri S.B. Palshikar award at the Annual Exhibition and the Late Shri D.G. Shirgaonkar for Best Portrait from Sir J.J. School of Art, Mumbai. In 2008 he received the Art Society of India award at Jehangir Art Gallery, Mumbai. In 2008 he received an award from the Maharashtra State Art Exhibition, Mumbai. 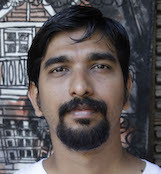 In 2008 he received Artist Residency Scholarship, Goa. In 2015 he received Artist Residency Scholarship, Thailand.